Have you ever met someone whose laugh and smile was just contagious? Would you go out of your way to find that person so that some of their happiness might rub off onto you? Turns out you just need a prescription of them. The act of laughing and smiling is a powerful healing agent for depression, anxiety, and can reduce stress. Not only can laughter make you feel all warm inside it also can help boost your immune system. Clearly laughter is good for both body and soul. Finding sources of positivity and laughter can be found in the little things in life, you just need to know where to look. W. H. Auden described his loved ones best when he said “Among those whom I like or admire, I can find no common denominator, but among those whom I love, I can: all of them make me laugh.” It is easy to laugh at the way your loved ones portrays stories and provide commentary on everyday life. Life is full of mishaps, its’ just finding the humor in it after it is all said and done. Frequent sources of humor come from funny animal incidents. 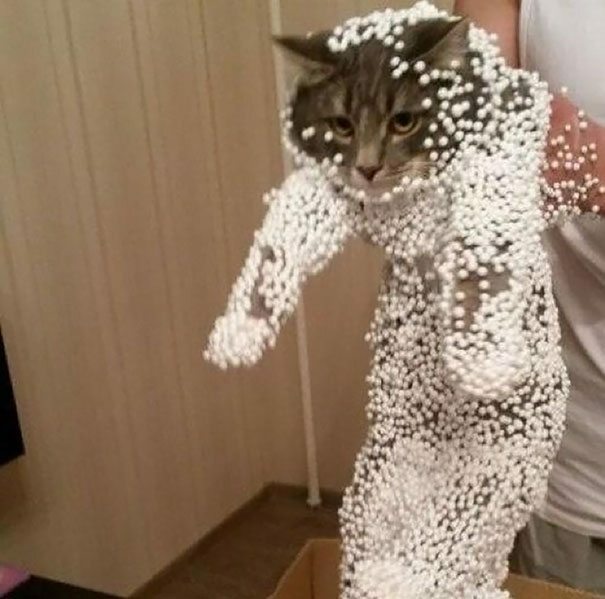 This poor guy fell into a viscous trap of static Styrofoam balls and instantly regrets his decision. Life is a series of moments, finding the humor in it is the key. There is a reason why everyone stays up for comedy hour, too shake off the negativity of the day. Having a good laugh after a long day puts you on the right track for the next day. Laughing before bed will help you fall asleep and end the day on a positive note. Jimmy Fallon could be considered your unpaid therapist.